WHILE the discourse regarding a possible reunification of Ireland (hastened because of the implications arising from Brexit) has increased in tenor, so too it appears has been a re-doubling of attempts by the establishment and media in the Twenty Six Counties to intensify the partitionist thinking of the public. Either this sentence was poorly constructed, or plucked out of context (which appears unlikely), or was phrased this way to link only the IRA with violence in Belfast in 1921. In response, I wrote a short letter to the Irish Times to complain. I waited a week to see if they would publish it but they never did. I asked: “Why the juxtaposition of that sentence above which suggests the IRA was responsible? Why the oversight or reluctance in stating that the majority of civilians to die in Belfast at the time of partition were Catholics who were killed at the hands of the new state’s forces, the RUC and B-Specials and its paramilitary supporters? “My grandparents and hundreds of thousands of others suffered, indeed were sacrificed, so that Twenty Six Counties could have its freedom. There is no doubt in my mind that one of the most important ideological battles to be fought by republicans today is the pernicious attempt by the establishment and its allies to estrange the public in the South from the North and to attempt to make the South synonymous with a completed Irish nation. THE geographical mutilation of the map of Ireland, on display recently on RTE’s Late Late Show, is symptomatic of a deeper psychological malaise that insidiously pervades those institutions and the powerful class of people who run them, in the service of the southern state. The malaise takes the form of an historical political amnesia. It began when the republican forces were defeated during the Civil War in 1923 and continued under the leadership of Éamon de Valera and Fianna Fáil and William Cosgrave and Cumann na nGael, later known as Fine Gael. Both parties initiated and perpetuated a narrative, almost a two-nations’ theory, which sets aside thousands of years of history and presents the southern state, initially established as the Free State and comprising Twenty-Six counties as the Irish nation. In 1948, when the then Taoiseach, John Costello, introduced the Republic of Ireland Act and repealed the remnants of the British monarchy’s statutory role in the state, the perception was encouraged that the south had fairly completed the task undertaken by the visionaries of the 1916 Proclamation and the Democratic Programme of the First Dail in 1919. This myth was intensified, particularly after the conflict broke out in 1969. Given a choice of acting to defend and represent the principal victims of partition (northern nationalists) and confronting the British government which supported the ‘Orange State’, Dublin chose instead to facilitate the bully. So the Dublin establishment had to emphasise just how different and apart the North was from the rest of Ireland. We were not really, really Irish. The poor unionists were misunderstood. The British were in the middle, keeping apart two warring tribes. Republicans were evil – were to be repressed and silenced. The geographical mutilation of the map of Ireland is a microcosm of the routine and daily verbal mutilation of the nation contained in RTE’s coverage of national events. RTE presents itself as a national broadcaster representing the views of all the people of Ireland, whether they live on the island or its off-shore islands. But in reality its main focus is on the people who live in the Twenty-Six Counties, which is the Republic of Ireland but not the Irish Republic declared by Pearse in 1916. This editorial policy of excluding, or removing to the margins, the people of the north, a population of 1.8 million, is reflected daily in RTE’s radio and television coverage. However, the geographical and verbal mutilation of the nation by RTE is a mere reflection of the sentiments heard and the speeches made in the Dail and Seanad to turn the state into ‘the nation’ and which equate the state with the nation. It encourages the thinking that people have no responsibility for what goes on in their own country and perpetuates a partitionist mindset. 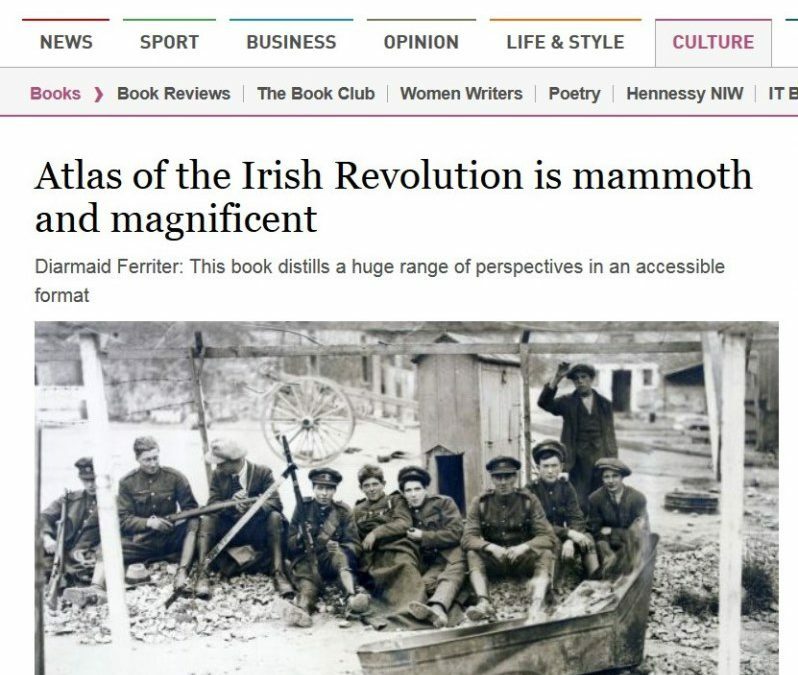 RTE, in its endeavours to confine the nation to the southern state, is a mirror image of the Belfast-based BBC, which defines the six counties as a country. Hence the boast and strapline by the popular Steven Nolan that his current affairs programme is “the biggest in the country”. The BBC’s promotion of the six counties as a country and its non-stop use of ‘Northern Ireland’, is aimed at reinforcing the idea that the north is both unionist and British. “Yes”, I said,” but remember you are in Ireland.” Perhaps to rectify this anomaly BBC NI should be rebranded as part of the BBC’s World Service. The BBC treats the southern state as a foreign country through minimal coverage of day-to-day affairs. What confounds these continual attempts to reinforce partition is that too many people across the nation think differently and haven’t been brainwashed or cowed. Forty thousand people cross the border daily to work. Not for a second do they think they are going into another country. Sinn Fein, unlike the other parties, gets elected in both jurisdictions – indeed is the largest party on this island. One cannot help but feel that at the end of the day these attempts to consolidate the partition of Ireland in the minds of the people, are doomed to failure and can only delay the inevitable – an island organised and managed on a Thirty-Two County basis.